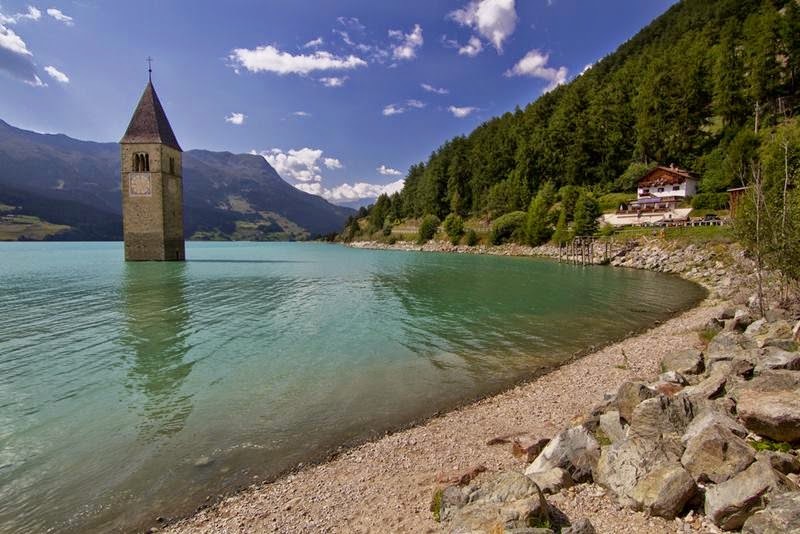 Reschensee or Lake Reschen in Italian Lago di Resia and in German Reschensee is an artificial lake in the western portion of South Tyrol, Italy, to be exact at Curon in Val Venosta. The Campanile di Curon " Bell Tower " is a leftover of the old town of Curon. 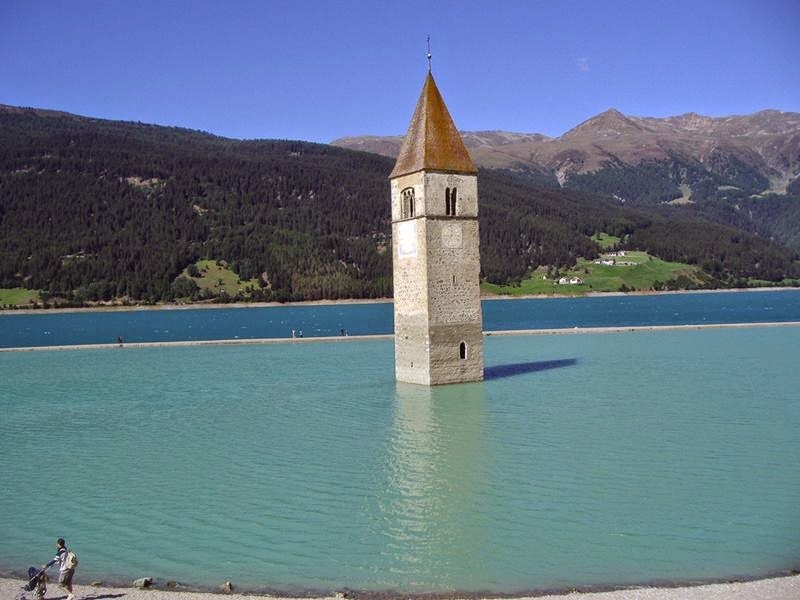 Its striking landmark - a steeple towering from the lake, approximately two kilometers form the border with Austria, and three kilometers from the border with Switzerland. With its capacity of 120 million cubic meters and it is the largest lake in the province. Its surface area of 6.6 km² makes it also the largest lake above one thousand meters in the Alps. 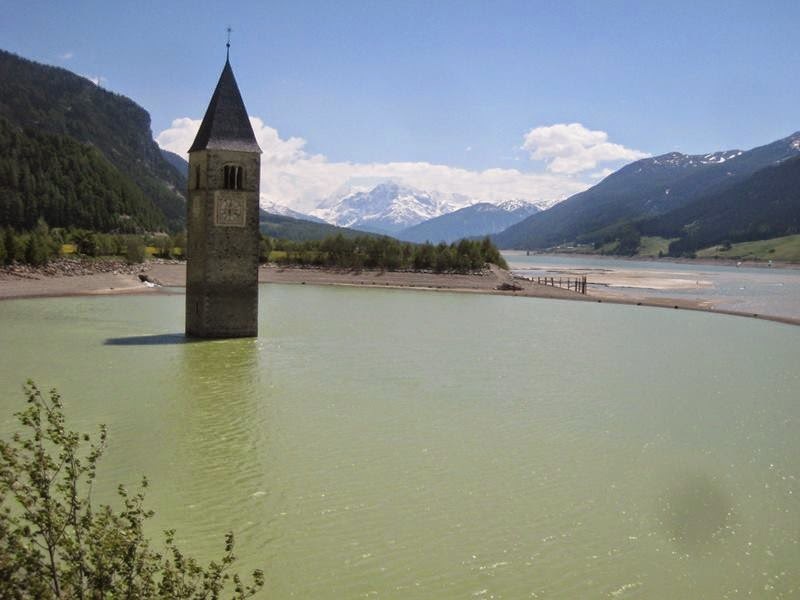 It is fed by the Adige, Rojenbach and Karlinbach and drained by the Adige. 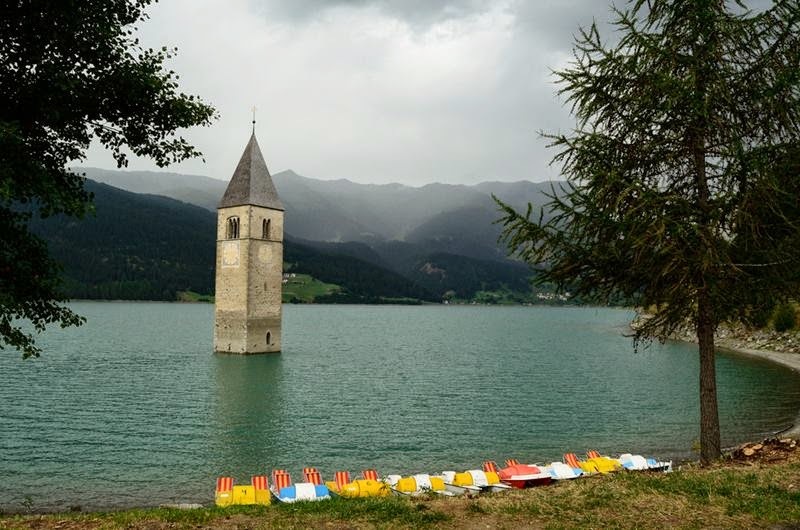 The lake is famous for the steeple of a submerged 700 year old church; when the water freezes, this can be reached on foot. 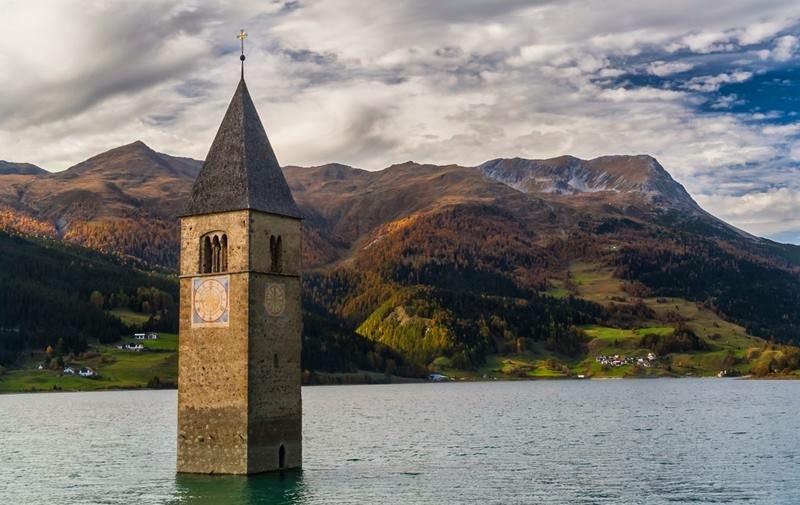 A legend says that during winter visitor can still hear church bells ring, but the bells were removed from the tower on 18 July 1950, a week before the demolition of the church nave and the creation of the lake. 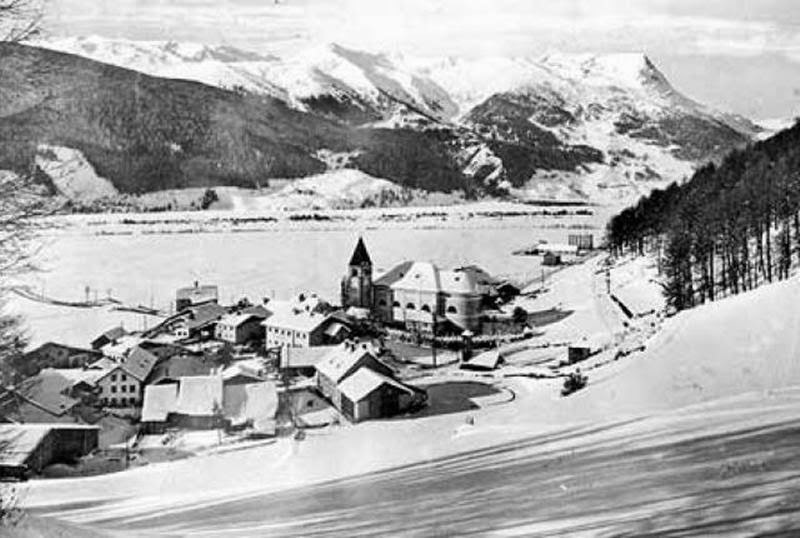 In 1920 the main plans is five meter deep artificial lake but in July 1939, the Montecatini company (now Edison Energia) introduced a new plan for a 22 meter or 72 ft-deep lake, which would unify two natural lakes "Reschensee and Mittersee" and submerge several villages, including Graun and part of Reschen. The creation of the dam started in April 1940 but, due to the war and local resistance, did not finish in a year. 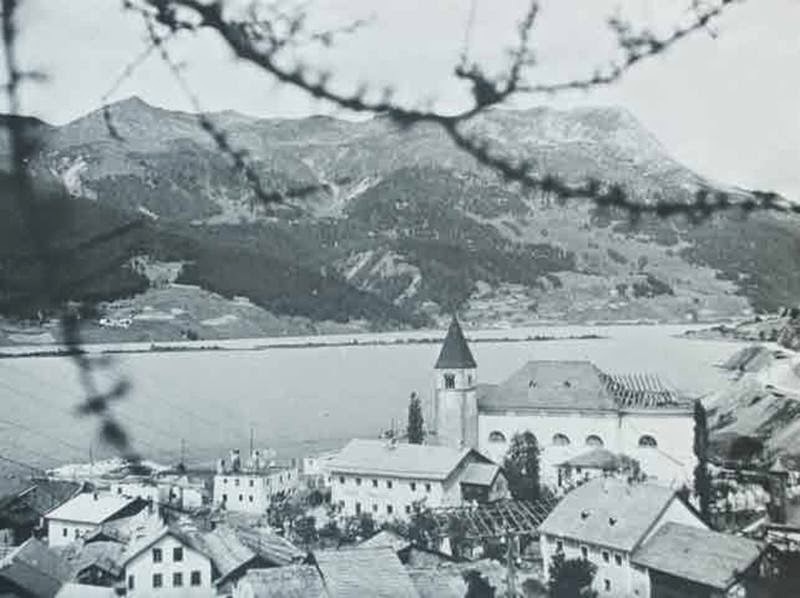 In 1947 the Swiss company Elektro-Watt paid 30 million Swiss francs for the construction of the dam , in exchange for 10 years of seasonal electricity. In total 163 homes and 523 hectares of cultivated land were submerged. About 150 families were robbed of their lives, half were forced to emigrate. The compensation was very small. 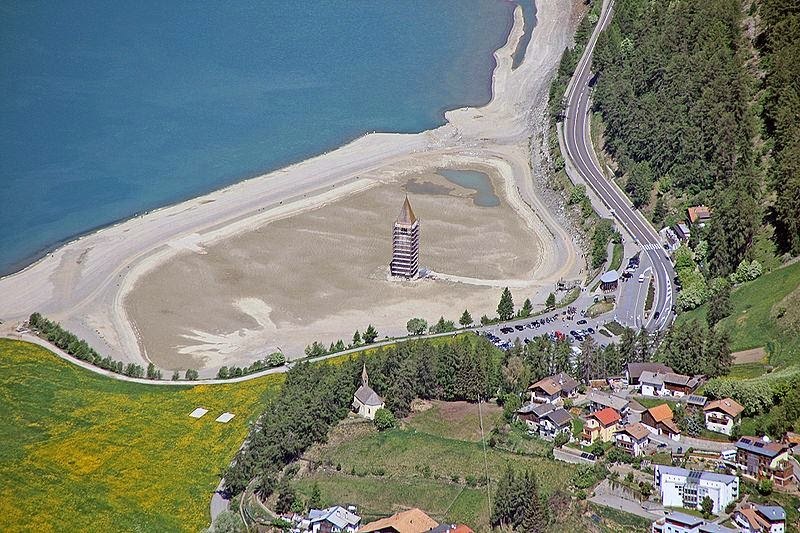 Today the tower is the only piece left alive, to remind the village of Curon. 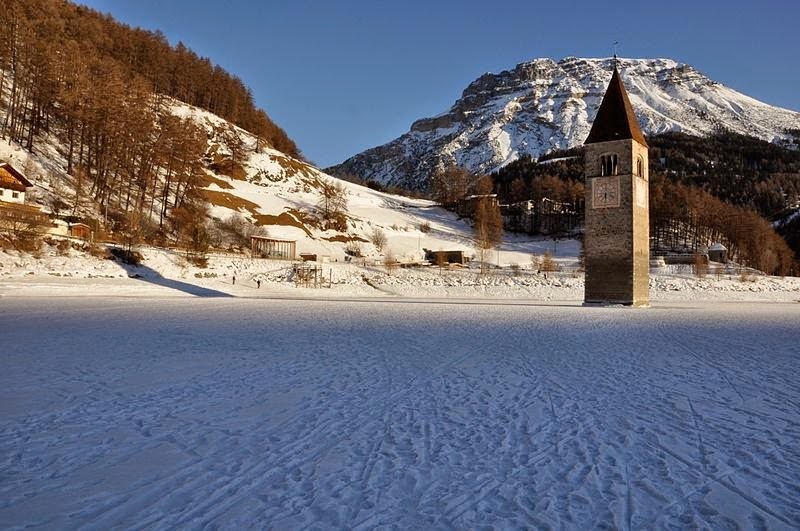 The bell tower was put under the protection of the fine arts department and became the symbol of the town of Curon. On 9 July 2009 restoration works were concluded: the water level of the lake was previously (in May) slightly lowered to allow work on the recovery of static structure, but also on the cracks that were present in corners of the north and north-east facades, most likely caused by the infiltration of water in small cracks and its subsequent winter frosts. Even the roof was restored, as the bell tower is considered a medieval heritage to be protected. The total cost of the restoration in 2009, was around € 130,000. 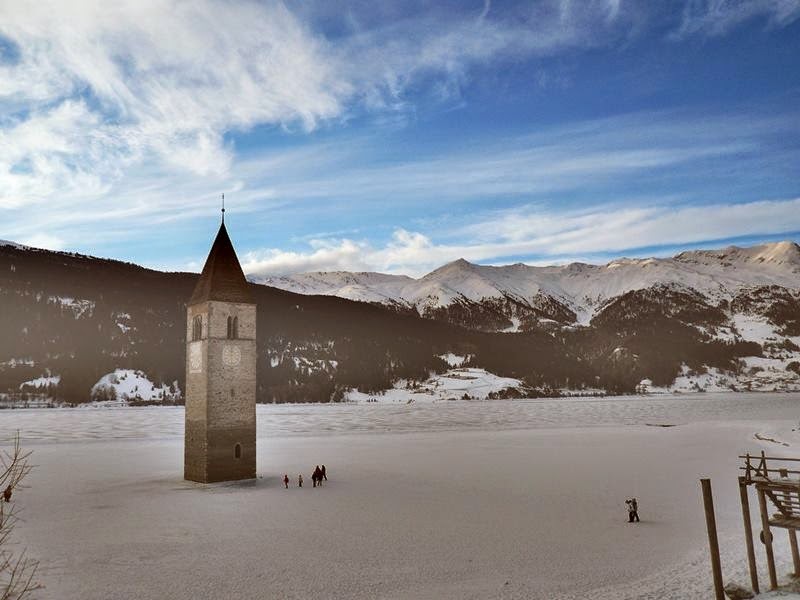 In winter, when the lake freezes, the bell tower is within walking distance. 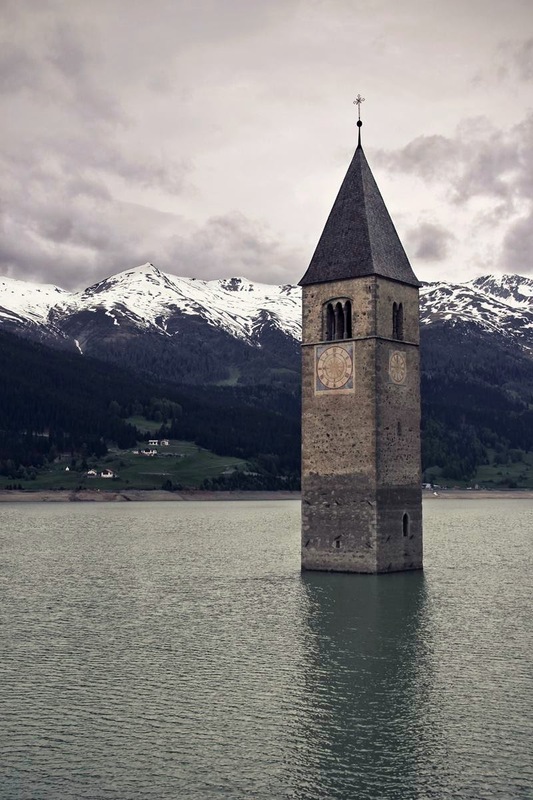 A legend tells that in some winter days is possible to still hear the bells ringing (which instead were removed from the bell tower July 18, 1950, before the formation of the lake).